Last season’s Fall Nature Photo Scavenger Hunt turned out to be a lot of fun – both for us and for those of you who played along. Since winter often finds us struggling for an excuse to head outdoors in the face of cold temps and generally dreary weather, it seems like some new inspiration is in order. The only rule for the winter nature photo scavenger hunt is that there are no rules. I’ve come up with some prompts to inspire you to head outside, but exactly what you photograph and when during the season is entirely up to you and your little explorers. There are 30 ideas listed here, but winter is three months long. That means you can take your time checking items off the list. Come mid-March, you’ll have a wonderful collection of memories of your time in nature. 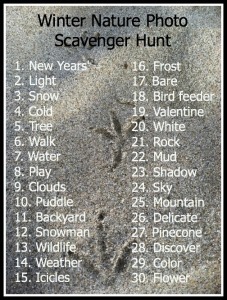 Get your free printable Winter Nature Photo Scavenger Hunt list. Post it somewhere you’ll see it every day. Head outside and into nature with your family and start exploring! Head to the Go Explore Nature Facebook page or Instagram (follow me @goexplorenature). 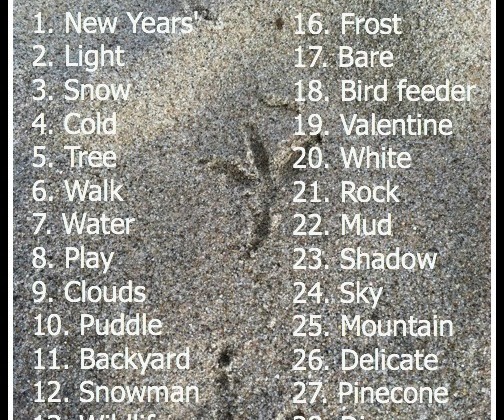 If you’re on Pinterest, send me your username & follow any of my boards; you can then add your photos to my Winter Nature Photo Scavenger Hunt board. And if you’d love to play along but have no desire to share your photos publicly, please do so! Done. Look forward to having you join us! Debi, can you send me a Pinterest invite, so I can pin? I pinned on previous ones, but I guess you need to invite me to this board… Thank you! What a wonderful idea! Thank you for sharing. I was planning on sharing this post with my readers here very soon. May I have permission to use the list image above in my post? Thanks a bunch! <br />God bless,<br />Tracey M.
We had a lot of fun with our fall hunt, so hoping this one is even better. Trying to make a point of taking the camera out on our adventures at least once a week helps, too. Great idea to do it over the entire season! Great, Alexandra – your invite is on its way! We want to play along too! Here is my pinterest: http://pinterest.com/alexdk/ <br />Let me know if you need more info! Thank you, Joy! This is one way we&#39;re getting excited about the change in seasons. Best to you! Great to have you along, Dawn. You guys will have so much fun! Love this idea, Debi–both for the kids and for my blog. Inspiring, as always–thanks! This is a great idea Debi. We will be playing along.